This brings me straight to my topic: The ISL bribery system: 138 million CHF for high-ranking officials in the Olympic world. It is a serial story. It is a never-ending story. The story began in the sixties and seventies of the last century when Horst Dassler, the former boss of the sportswear-giant Adidas, formed his so called „sport-political department“. Later, in the early 1980s, after the groundbreaking Olympic Congress in Baden-Baden, in the new age of Olympic commercialization and professionalism, Horst Dassler also created a marketing company: International Sport and Leisure – ISL. And to give you another example: this company, ISL, was the first to get IOC contracts to deal with the newly invented Olympic marketing program – TOP. Don’t be afraid: I will not go back to the 1970s. Nor will I repeat the presentations I gave at former Play the Game conferences. But I would like you to understand that this also a never-ending journalistic story which, I think, began in 1992 with the book „The Lords of the Rings“ written by Andrew Jennings and Vyv Simpson. In 2000 I presented some exclusive documents illustrating the circumstances under which the ISL group was able to secure the biggest TV- and sponsoring-package of the time, worldwide: the contracts for the FIFA World Cup 2002 and 2006. In 2002 I presented exclusive, original documents about the collapse of the world’s biggest sport-marketing company ISL. In 2005 and 2007 we discussed the dubious circumstances under which Swiss prosecutors had to work in the ISL case. Now, in 2009 we can take a look at the ISL bribery court case in Zug/Switzerland, which took place in spring 2008. According to Swiss law I am not allowed to show you all details of these documents. On the other hand: According to Swiss law it was allowed to pay at least 138 million CHF to high ranking sport officials. In legal terms: bribery was not a crime in Switzerland at that time. The ISL system of paying sport officials was worked out – as it came out during the court hearings – together with KPMG, some of the most famous law firms in Zurich and was officially permitted by the Swiss Tax Authorities. At the Play the Game conference in 2011, I guess, we shall probably analyze the next court case in the ISL saga. I will come back to this later. An impressive number of sport officials and assistants, who have worked for Horst Dassler, for Adidas and the ISL company, who were created and brought into their positions by the visionary Dassler, are still in their positions in the Olympic world: as Presidents of International Federations, as IOC members, as so-called consultants, or – much more clear – as bagmen. One of Dassler’s closest assistants was Jean-Marie Weber. The French born Weber was always described as THE BAGMAN. What we got to know at least during the trial in spring 2008: Jean-Marie Weber was the man who paid at least 138 million CHF to high ranking sport officials in the Olympic world between 1989 and 2001. After Dassler’s early death in 1987 Weber became one of the top managers of the ISL group. The group was united under the ISMM umbrella in 2001 when the marketing giant collapsed because of mismanagement, greed and megalomania. It was the second biggest collapse in Swiss economy after the Swiss Air crash. 120 million CHF were paid between 1989 and 1999. 18 million CHF were paid between 1999 and 2001 until the bankruptcy procedure began. Another 18 million CHF, by the way, were transferred to a bribery account, the secret Nunca foundation in Liechtenstein; but had to be re-transferred in spring 2001 because of the financial difficulties of the ISL group. So if you like, we can talk about 156 million CHF. And we can speculate about much more money. Imagine: According to criminal scientists about 95 to 98 per cent of all corruption cases never see the day of light. They remain undisclosed for ever. The reason for this is based in the system of corruption: money givers and money takers do not usually sign contracts. Who has got the money – the SCHMIERGELD, as they use to say in German speaking part of Switzerland? Only Jean-Marie Weber knows who got it. How much money did ISL pay in the 1980s? One can only estimate it. How much money was really paid to sport officials over more than 20 years – not only over a period of 12 years? One can just estimate it. How much money have ISL’s opponents paid, all those other marketing companies in the huge market? Same answer: One can only estimate it. How did the International Federations, how did the IOC, how did the so called Ethics Commissions react after the ISL trial? Short answer: There was no action at all. I have asked several senior officials. I do not know any reaction which I have to take seriously. No investigations at all. Before I come to the question „Who got the money?“ I have to give you a short and simplifying overview of the whole ISL case. Simplifying, because I am a journalist. ISL/ISMM went into liquidation. Damage: more than 3 billion Euros owing more than 450 million Euros to creditors. FIFA lodged a criminal complaint against ISL/ISMM executives (money from Globo TV and Dentsu – around 75 million Euros). 2002: Thomas Bauer, ISL liquidator, wrote to a number of football officials. If they did not return black money payments he would sue them, Bauer pointed out. May 2003: Bauer opened civil complaints against approximately 20 sport officials. Feb 2004: Mysterious arrangement between Bauer and Jean-Marie Weber. 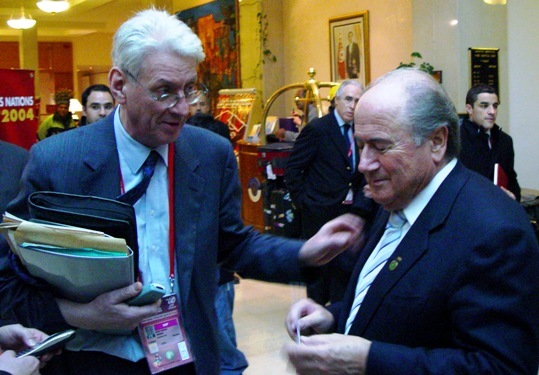 The office of Peter Nobel, personal lawyer of FIFA-President Blatter, acted on behalf of Jean-Marie Weber. Mar 2004: 2.5 million CHF were transferred to the liquidators‘ account. Mr Bauer withdrew the civil complaints against high ranking officials. Apr 2005: … and finished his investigation in spring 2005. Jul 2005: Decision of the highest Swiss court, Bundesgericht (pdf, 10 pages, 500 kb). The court outvoted an earlier and lower court decision in which lawyer Nobel was forced to give information about the 2.5 million CHF payment, the payer and the „third party“ for which he was acting for. Nov 2005: Raid in FIFA’s headquarters. 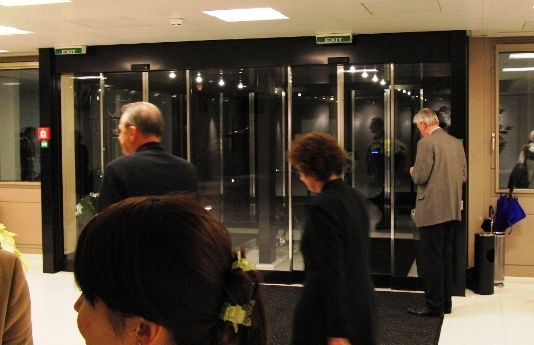 Mar 2008: ISL/ISMM trial in Zug (Strafgericht) against six former ISL executives. Jul 2008: The verdict: Weber was fined for embezzling cash that he refused to account for. Two other people were given small fines for false accounting. Three more men were cleared. Ongoing: Magistrate Thomas Hildbrand investigates who got the ISL bribes and who paid the 2.5 million CHF for Jean-Marie Weber. One important question: WHO HAS GOT THE MONEY? The answer is simple: senior officials of the contractual partners of ISL. Five of the defendants claimed they had no idea who got bribes. They claimed fellow director Jean-Marie Weber organized the payments. He laundered them through foundations in tax heavens and a British Virgin Islands company (and many others), which distributed the money to companies and individuals. Most of the money was given in cash. Other former partners – and last but not least with the IOC: from 1983 until 1996. The key for getting and holding these contracts was a gigantic bribery system. But we can’t even find the word „corruption“ in the Olympic Charta, the constitution which governs the IOC and runs the Olympic Movement. The phrase „corruption“ does not exist in the Charta. Nevertheless: corruption exists in the movement. There are a lot of definitions in different fields: juridical, theological, political, social-cultural, economical, ethical definitions. It is a wonderful playing-field for word-artists; but one does not have to be a lawyer to talk about corruption. Common sense is quite enough. That is why I prefer a very clear and very simple definition; it is the definition of the NGO Transparency International. I think it is simple enough. Now you can see a list of recipients of the ISL payments. It is just a part of the list: we can find individuals and companies. But it is only a small number of all recipients. We still don’t know more than 80 per cent of the bribe-takers. Probably we don’t know more than 95 per cent – it can just be estimated. There are just a few well known names on the list: Nicolas Leoz from Paraguay, head of South American Football Federation CONMEBOL, and member of FIFA’s Executive Committee. Just a few hundred thousands for him. Mr Leoz denies any wrongdoing. On the list we could also find the company Renford Investments. According to an investigation by the Swiss journalist Jean-Francois Tanda, Renford was owned by Ricardo Teixeira, President of the Brazilian Football Federation CBF, FIFA Exco Member, and his former father in law João Havelange, FIFA President between 1974 and 1998, IOC member since 1963 – the doyen of the International Olympic Committee. By the way: Once there was also a dubious transfer of a million CHF which was once accidentally transferred to a FIFA account and was immediately re-transferred. But coming back to the ISL bribery system, which was mostly a cash system. As I have said earlier: According to all defendants in the ISL court case Jean-Marie Weber is the only person who knows the names of all takers. Simply because he has organized all payments to sport officials. As I have mentioned earlier: The two parties in corruption cases don’t usually sign contracts. These payments were confidential and I must respect that confidentiality. 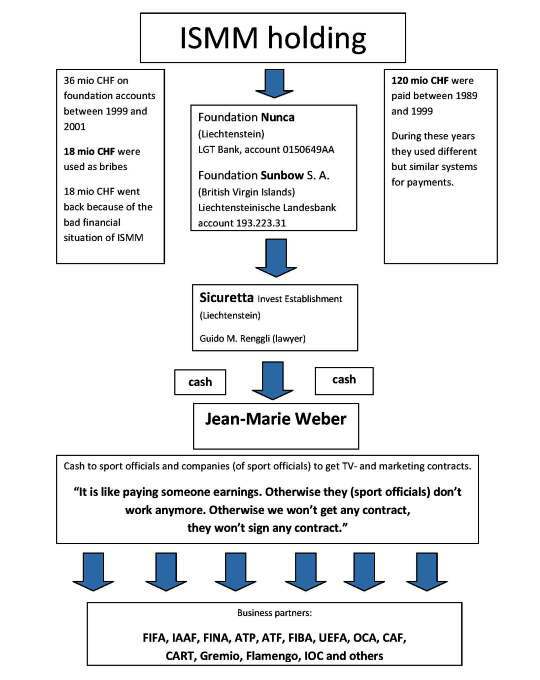 Here you can see a simple chart of the bribery system in the last years of the ISL company. The chart is based on the court files and a chart which was presented by judge Siegler during the trial. Christoph Malms, former Chief Executive, said that after joining ISL in the 1990s he was shocked to discover the business was built on bribes. „I was told the company would not have existed if it had not made such payments“, Malms testified. During the hearing Malms‘ lawyer Werner Würgler desperately attacked two FIFA Presidents and IOC members: Blatter and Havelange. Würgler claimed that Joseph Blatter, back then General Secretary and now President, had approached his client Malms and told him, if ISL wanted to keep FIFA’s business, Jean-Marie Weber would have to stay in his positions in the company. If not, „it would be bad for ISL“. Würgler also said that during the World Cup in France 1998 the outgoing President Joao Havelange made the same demand. Würgler described the situation as follows: Anybody at FIFA who knew about the bribes and who was getting SCHMIERGELD could exercise great power over fellow officials. Würgler said: ISL became a private source of money for FIFA officials, virtually something like their private bank. 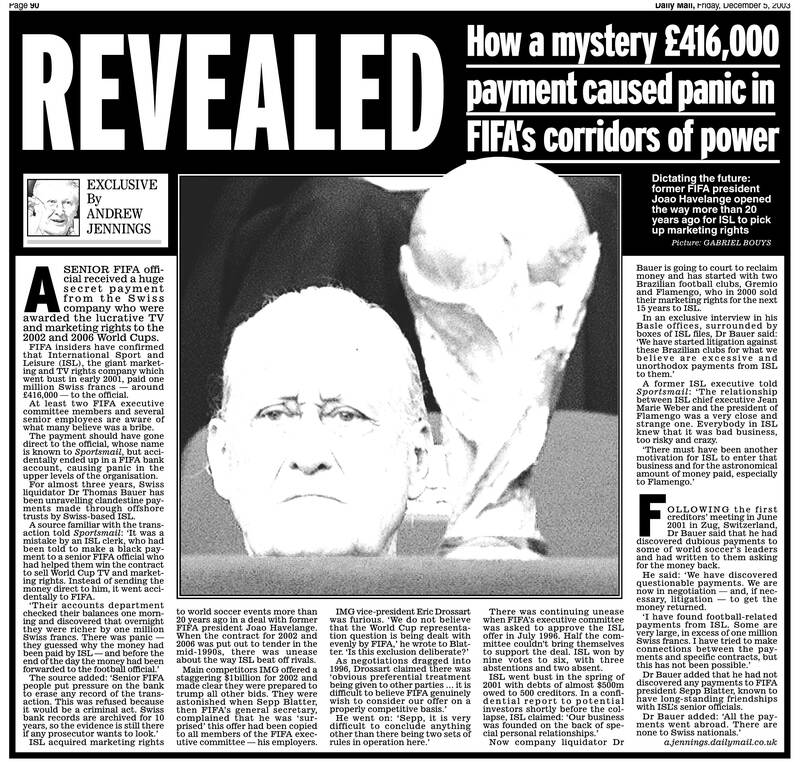 There are numerous well documented, strange operations within FIFA. In their decision the three judges in Zug stated that FIFA „knew more than they told investigators“, that the behavior of FIFA-officials „was not always in good faith“, and some of their claims „were not credible“. In the ISL case FIFA was ordered to pay a part of the trial costs, despite claiming not having misled the authorities. We have got an astonishing documentation of a huge bribery system. Some experts are saying: This is the biggest bribery system in Olympic sports ever. But nobody in the sporting world has taken any action. Not even against senior officials who were mentioned in the court documents. Who should have taken action: Sepp Blatter? Havelange? IOC President Jacques Rogge? By the way: Have I mentioned that Jean-Marie is still a member of the family? He is working with IOC members like Lamine Diack (President of the IAAF) and Issa Hayatou (Vice President of FIFA and President of CAF). As I said before: from a strictly juridical point of view the ISL payments were in accordance with the former Swiss law. But the payments were never in accordance with the rules of sport federations and organizations. Olympic sport organizations are always arguing that their moral and ethical rules have to be much higher and harder than other rules. The ISL bribery case appears to be a strange example for the extremely high standard in the Olympic family. You want to read more? I recommend Andrew Jennings‘ website: Transparency in Sport. Jens, wer ist eigentlich das / wer sind die Nachfolgeunternehmen der ISL? Wer sorgt heute für ähnliche Vertragsabschlüsse? Nachfolgeunternehmen gibt es ja nicht. Nur Firmen, die den Job übernommen haben. Teilweise mit denselben Leuten, denselben Strukturen und in denselben Büros in der Grafenaustr. in Zug. Haben sie auch die Methoden übernommen? Nun, am Beispiel René Fasel/Infront stellt sich die Frage aus gutem Grunde. Andere Beispiele ließen sich anführen, die eine Erörterung vertragen sollten. Wenn die FIFA seither ihre TV- und Sponsorenrechte selbst makelt, scheinen die Gehaltszahlungen nicht mehr nötig zu sein. Wer weiß. In seinem Buch FOUL! The secret world of FIFA gibt A. Jennings – den subtiler gewordenen Strategien der Korruption entsprechend – subtil Antwort auf die Frage der ‚Nachfolgeorganisation der ISL‘ bzw. das System ISL. Die Organisation des sinistren Handels ist jetzt, wenn ich es richtig verstanden habe – und wie JW schon anzudeuten scheint – vollständig internalisiert, d.h. die Kontrolle über das Auftauchen von geflossenen Geldern liegt jetzt komplett bei der Mutter … an die bzw. deren Bücher wohl kaum heranzukommen sein dürfte, und dies sogar dann, wenn man es denn überhaupt wollte (Wie die Schweizer Justiz der Machtfülle von Weltsportverbandspräsidenten oft begegnet, zeigt ja die Goijman-Geschichte, von der hier vor kurzem die Rede war – erschütternde Lektüre hierzu ist der Bericht, den M. Goijman dazu verfasst hat, und der über einen Link auf Play The Game aufzufinden ist). Wo es, vereinfachend dargestellt, keinen externen Partner mehr gibt, sondern nur noch vom alleinigen Souverän des Shops bewilligte Bonuszahlungen an Angestellte, bzw. überhaupt Arbeitsverträge und deren Dotierungen nach unkontrollierbarem Gutdünken, ist die Korruption scheinbar ein- für allemal besiegt. Als Thema jedenfalls.